She passes by a group waiting to be seated, and all of them stare at the back of her head as she walks away. One guy even rolls his eyes. Initially, Wall elaborates on her “learning experience” when people would ask her questions, the most common being “So, where are you from?” She has abandoned these efforts. Now, when people ask about her attire, she simply says she is not Muslim but wears the hijab because she chooses to do so. This explanation is not entirely untrue, as Wall admits to not being able to leave her home without the clothing. Wall says she receives different reactions when she wears the hijab. A man once fell into a display at Wal-Mart because he was staring at her. One day a group of male patrons at the restaurant where she works refused to be served by her. The same group called her derogatory names. But most of the time she said she is just respectfully avoided. 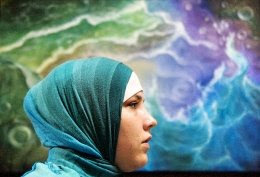 The experience has taught Wall to pay attention to smaller details that would make a traditional Muslim lifestyle difficult to follow in the United States. One day at a clothing store, Wall had to ask for a sheet to cover a gap between the floor and dressing room door so she could hide her bare legs as she changed. Her job as a waitress presents one of the most awkward situations as it naturally entails a lot of physical contact with strangers, which is not allowed for Muslim women, she said. Wall has grown to appreciate this sort of privacy and, in some ways, respect it. Perhaps the most unexpected outcome of the experience is a newfound devotion to her Christian faith. The Islamic faith requires followers to pray five times a day, the first prayer being at 5 a.m. Though Wall has not yet assumed this tradition, she admits she may in the future, and finds herself praying more often. Read the complete article at The Daily Texan.